Is it a hat? Is it a visor? 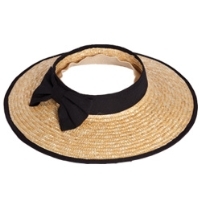 Keep a cool head and shady face with our NEW straw visor featuring a black bow and trim for a special touch. Brim = 4"